By way of introduction, I am retired from the U.S. Army having served 26 years on active duty and 6 additional years in the reserve component. 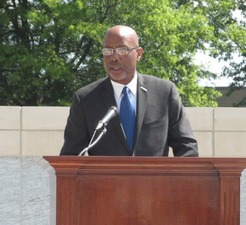 Currently I serve as the Chairman of the Veterans Affairs Advisory Board of DeKalb County, Georgia, which is responsible for the county’s veteran recognition, advocacy and research programs on behalf of its 41,000 veterans. I also serve IAVA as a Georgia Leadership Fellow, focusing on veteran leadership development, policy advocacy and team building. These experiences help me better understand the needs of veterans but also the challenges they face accessing quality care in a timely and efficient manner. IAVA is proud to have previously testified in front of this Subcommittee recommending the need for consolidation of care in the community for veterans enrolled in VA health care, and we applaud Congress for requiring VA to put forward a plan for consolidation. We also want to recognize senior leaders at VA for acknowledging the need for consolidation and providing an inclusive, veteran-centric and transparent plan. Last year, when the Surface Transportation and Veterans Health Care Choice Improvement Act of 2015 became law, it helped begin the process of removing a lot of confusion for veterans. However, according to IAVA’s most recent Member Survey, only five percent of respondents had taken advantage of the Choice Program, and their reviews on satisfaction were mixed. For the 95 percent of IAVA members who had not used it, 43 percent reported not using it because of confusion as to how to use it. It’s clear that simplification is needed. Confusion over the Choice Card is not the only barrier to accessing timely and quality care. In IAVA’s member survey, nearly half of the respondents were not even familiar with the Choice Program. In my home of Atlanta, Georgia, the enrollment for health care at the Atlanta VA Medical Center (VAMC) is growing faster than the capability for primary care. According to VA population data, the number of veterans residing in the 28-county metropolitan Atlanta area in 2013 was 294,000. The 2014 VA population data reflects more than 361,000 veterans living in that same area. To meet this increased use, in the past 18 months, the Atlanta VAMC has hired an additional 600 employees. Related to this move, on January 20, 2016, Atlanta VAMC stated the current wait for VA initial primary care appointments was at 60 days, but after speaking to the VISN 7 VHA Director on January 26, she advised me she was able to help the Atlanta VAMC Director reduce the 60-day wait time down to 20.6 days. If this number holds true, the reduction in wait time by nearly 40 days in the matter of 6 days, is remarkable. We hope other VA medical centers will follow suit, and we hope this Subcommittee will continue to monitor, analyze and ensure accuracy of wait time data, including at the Atlanta VAMC. As Congress hopefully moves forward to simplify a confusing process for veterans, IAVA highly recommends Congress work with VA and use its plan as the framework for legislation in order to avoid one-off proposals that are misinformed or put politics ahead of veterans. After all, it was Congress who provided the numerous different plans that added to the confusion and inefficiencies which resulted in the need to consolidate care. We believe Congress should be mindful of these lessons, learn from them and leverage the VA’s plan as the framework for consolidation of care moving forward. Our second concern centers around VA’s ability to effectively implement a plan to consolidate care across their enterprise in a way that avoids many of the mistakes made during the implementation of Choice and truly puts veterans at the center of every decision. While the VA Budget and Choice Improvement Act of 2015 extended provider eligibility to any health care provider meeting VA criteria, the VA must use this opportunity to streamline and standardize the requirements for medical documentation. Under the Choice Act of 2014, reimbursement rates for non-VA providers is limited to no more than the MEDICARE reimbursement rate, thus standardizing and reducing administrative requirements can remove a barrier to more providers joining the network. The VA intends for its health delivery model to be the patient-centered medical home for the veterans under its care; therefore, the VA holds responsibility for direct coordination of services for each veteran. Care coordination is one of the core functions of primary care. A significant number of the VA’s patient needs are complex, and as the complexity increases, the challenges in facilitating the delivery of the appropriate care increases. Factors that increase the complexity of care include: multiple chronic health problems, the social vulnerability of the patient, the number of providers and the patient’s ability to coordinate their care. Due to the significant number of VA patients with anxiety disorders, dementia, depression and kidney failure, it is necessary for the VA to maintain significant control and accountability for the provision of veterans’ care. To address these inconsistencies and shortcomings, IAVA recommends the VA continue to collaborate with all stakeholders who share their vision of putting the veteran first and focus on values-based leadership in an attempt to change the culture of VA across the country. Given the shortcomings related to training frontline personnel on the implementation of Choice and customer service generally, the VA should also continue its efforts with myVA and make sure all VA employees are trained properly and consistently on the VA plan to consolidate care. Finally, IAVA encourages everyone, Congress, VA, VSOs, industry and other stakeholders, to place an increased importance on the quality of care veterans are receiving, especially new providers who have not served veterans since their residency training. It is important under the medical home model of primary care that the VA continues to coordinate and be accountable for the care provided to veterans given the complexity of care required. In closing, IAVA would like to thank this Subcommittee for your leadership and continued commitment to our veterans. It is a privilege to testify in front of the Subcommittee today, and we reaffirm our commitment to working with Congress, VA and our VSO partners to ensure veterans have access to the highest quality care available, and our country fulfills its sacred obligation to care for those who have borne the battle. We do believe there is an opportunity to transform the VA for today’s veterans if we all work together. Thank you, and I’d be happy to answer any questions you may have. As Leadership Fellow, Mr. Williams is a catalyst for veteran leadership development, policy advocacy and team building. He spent 26 years in the Army, two years in the National Guard and four years in the Army Reserves. In his last combat assignment, he was responsible to the MNFI Surgeon and MNFI Commanding General for independent coordination with various government and non-governmental agencies to support health sector partnership programs with the Iraqi government. He is currently the Chairman of the Veterans Affairs Advisory Board of DeKalb County, Georgia, responsible for the county’s veteran recognition, advocacy and research programs on behalf of the 41,000 veterans in one of Georgia’s largest counties. Mr. Williams holds advanced degrees in Religion and Public Policy. Neither Mr. Williams, nor the organization he represents, Iraq and Afghanistan Veterans of America, has received federal grant or contract funds relevant to the subject matter of this testimony during the current or past two fiscal years.